We are experiencing a new wave of data center infrastructure challenges. The introduction of virtual network and storage appliances has changed the traditional hardware-only infrastructure model, demanding new methods of physical and virtual infrastructure deployment. At the same time, data centers employ a mix of servers, storage, network, power and other devices from multiple vendors each with their own methods, protocols and proprietary tools for accessing the device consoles. The need of providing secure and reliable console access and control has increased. Management of such data center infrastructure must evolve, be vendor neutral and hardware independent. It should make use of the software flexibility to enhance the infrastructure features. A Software Defined Infrastructure – SDI – is the natural way to integrate the physical and virtual worlds of the data center and improve the management experience. SDI creates the flexibility to roll out new deployments and services throughout any private cloud. It is common to find vendors providing a myriad of ways to solve a similar problem. For example, there are many ways to access a device console. Besides, this console itself could take many forms. It could be a virtual serial, SOL or physical serial console. This forces the sysadmin to keep track of all different vendors’ UI commands and protocols in order to access the console of the IT device which could be a physical or virtual server, storage device, networking device or a power unit. The user experience should be the same regardless the underlying technology. 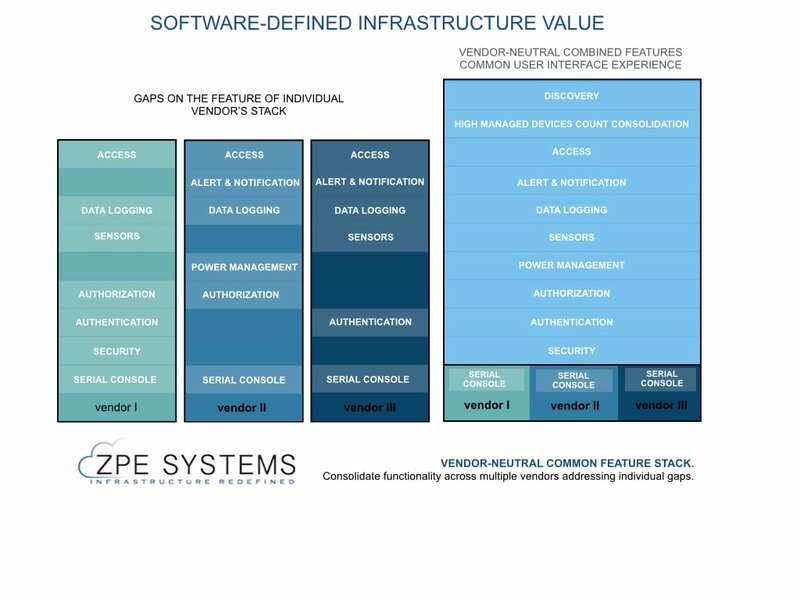 Rather than having multiple vendors implementing their features in discrepant ways or sometimes having feature gaps among similar solutions, SDI allows the user to redefine those features via software in a consistent way presenting the very same functionality to all managed devices. Also, new features added on the common stack automatically get extended to all devices. This allows bridging of feature gaps while extending the life of the existing infrastructure. The physical device features can be extended via SDI and become uniform to all vendors. Figure 1 – Vendor-Neutral solution. It addresses feature gaps and normalizes the user experience. This applies to virtual machines, service processors, serial consoles and power units. NodeGrid Manager® is the world’s first implementation of a Software Defined Infrastructure solution providing virtualized access and control over major critical infrastructure consoles. It consolidates user interfaces, network protocols and all features in one single easy-to-use solution. This software brings together a standardized user experience, a full management feature set and saves time and resources, while allowing administrators flexibility to deploy different vendor solutions or plan dynamic expansion/replacement of their data centers. Share the post "Data Center Management"